Enterprise hired 12 GCU grads into management training positions last year and also brought on five former interns from the University. The proof is in the hires. Between dozens of job fairs, networking and etiquette events, résumé reviews, mock interviews, Career IMPACT Center online tools website and more, Grand Canyon University students and alumni aren’t lacking free career resources. 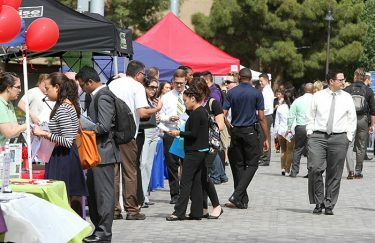 GCU’s Career IMPACT Center job fairs bring together large numbers of companies and students. More than 200 companies are expected on campus during the annual spring career fairs in February and March. Another 5,000 organizations are part of GCU’s Career Connections database, and nearly a dozen programs or events are scheduled for spring semester, an increasing number of which are college-specific. This creates an obvious advantage for GCU by helping students and alumni contact, network and ultimately land jobs. Once inside, however, the success of GCU graduates and alumni has created pipelines between the school and dozens of companies around the Valley and beyond, including, Vanguard, ADP, The Hartford Group, Enterprise and REDW. 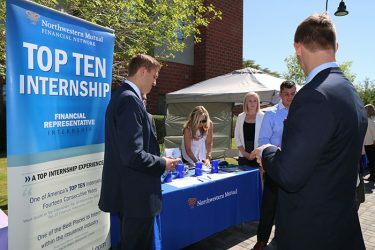 Northwestern Mutual is one of the many top-notch companies that recruit on campus. Vanguard has 47 GCU alumni in its Scottsdale workforce, including 13 who have been hired in the last two years, according to Danielle McCormick, Vanguard’s university relations specialist. Although it’s known as a financial and investment services organization, Vanguard employees have accounting, marketing, business, entrepreneurism and other degrees that seamlessly fit among its 10 divisions that extend beyond finance. Even better, Vanguard trains employees in any relevant financial and customer service knowledge. Shane Keith earned his Business Management degree from GCU in 2013 and worked his way up within Vanguard as an operations supervisor in the Scottsdale office. He said the company culture was a huge draw for him, and he’s had the opportunity to cross-train with three different departments during his tenure. Community involvement and its mission and values statements also attracted Kate Mears, who worked at Vanguard for several years before she went back to school and earned her Master of Business Administration (MBA) from GCU in 2015. “A lot of our values align with GCU’s and its students,” McCormick said. “I always tell people that the phrase ‘Find Your Purpose’ is the words you live by and the mindset to do your best for the communities and beyond. 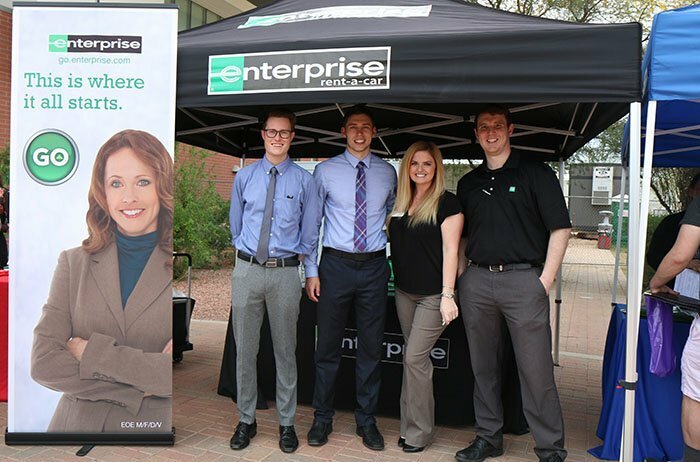 Enterprise, which operates transportation rental agencies and services, hired 12 GCU graduates into its management training program in 2016 along with five former interns for full-time positions. Katie Berry, Enterprise’s HR talent acquisition specialist, noted that two recent grads – Belen Avila and Matthew Craft – received “milestone promotions” within two months of being hired. Andree Reid was hired to join the management training program after he graduated with a criminal justice degree. Berry also said student-athletes are popular choices for employment by Enterprise and other service-oriented organizations. The list includes former GCU basketball players Isaiah Hamlin, Toby Okafor and Uros Ljeskovic. Companies that attend GCU career fairs widely considered it advantageous for them because of the timing: The fair before commencement in April allows both the companies and soon-to-be-graduates to get a leg up on possible competitors who graduate in May or even June. The REDW accounting and tax firm located near the Biltmore area employs two GCU alumni among its more than 50 Phoenix office employees: Christine Brunke (Class of 2010) is a senior audit associate, and recent graduate Christy Kiser is a tax accountant. So, too, are the increasingly symbiotic relationships between school and employer. Jan. 23: Human Resources, Inc.
For more information, visit the Career IMPACT Center website or call (602) 639-6606.